To begin at the end: it may seem strange that he initiated his real work as an artist by coming up against the limits of painting. Over the years, he has come to refer more and more to the series of black paintings that he made in the late 1970s. Having worked his way through what could be described as standard artistic apprenticeship, he soon found himself on the way to an endpoint that was, paradoxically, a true beginning. During his initial years in Berlin, the city was divided by a wall, a line that divided something both continuous (a single city) and discontinuous, in that East and West developed along divergent lines and came to exemplify differing kinds of social, political and cultural circumstances. It is a common enough occurrence in the world, with obvious echoes of the division between Ireland north and south, a division that extends, with symmetry of scale, right down to the communal structure of Northern Ireland, just as, indeed, the divided Berlin reflected a divided Germany, a divided Europe and, in the polarised scheme of the Cold War, a divided world. These relative political spaces, precariously balanced, if balanced at all, and often verging on being mutually exclusive, are a pertinent model for a large proportion of Smith’s paintings. An unease, even an anxiety that pervades the fabric of things, whether politically or physically, is intrinsic to them, and acts as a corrective to any temptation we might feel to view them in purely aesthetic terms. In all, they are works that relish their paradoxical nature. Samuel Beckett, in his Meditation Dante… Bruno. Vico.. Joyce, says: ‘Hell is the static lifelessness of unrelieved viciousness. 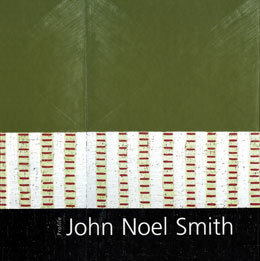 Paradise the static lifelessness of unrelieved immaculation.’ John Noel Smith’s paintings are journeys into the void between such poles. They are frictions torn from conversations, sometimes shouted, between order and chaos, truth and lies, space and time. They do not know their place. In company with them, neither should you. They use boundaries to question limits and use limits to question what might be elsewhere. They celebrate the sheer joy of paint and what you might do with it. Then they object to the illusion that paint could ever make things complete. Profile 26 – John Noel Smith. Oysterhaven, Kinsale, Co. Cork: Gandon Editions, 2007.